"Tulsi in all aspects and places is holier than holy. Where the breeze blows through tulsi plants, it makes the surrounding areas pure." Amla is a tropical gooseberry, but it is hardy to just a tad below freezing. It is an evergreen. If subjected to frost, it could die back to its roots, but reappear later. It is the primary herb in the famous rejuvenative jam, Chyawanprash, as well as the world"s richest source of stable vitamin C.
Asafoetida is both a culinary ingredient in South Asian cuisine as well as a medicine. It is called "hing" in texts and is the primary ingredient of hingvastak, a digestive remedy for people with deranged vata. The smell is considerably stronger than garlic, ergo its name "fetid". It is an antioxidant but should be used in very small quantities. Most powdered forms are greatly diluted. Bala is a tropical mallow, native to India. It thrives best in zones 9 to 12. In Ayurvedic medicine, it is used for all three doshic imbalances. It is a tonic herb and is therefore used for strengthening conditions characterized by weakness, including nervous disorders. Since it contains ephedrine, bala is sometimes restricted and used only in ointments for massage. However, in Ayurvedic medicine, it is also used internally, though with proper attention to dosage. Indian frankincense or shallaki as it is known in Ayurveda has many of the same properties as the North African and Arabian Peninsula varieties but the aroma is quite different as are the traditional uses. In India, boswellia is generally used to alleviate joint pains that are associated with arthritis, but it is also prescribed for bronchial asthma and Crohn"s disease. In Europe, it is being used to treat many kinds of cancer, but especially brain cancer. It is not easy to grow but can become tall, 30 feet. It requires watering when first planted but as the tree matures, it likes rather quick draining soil. It is the resin that is used both medicinally and to make incense. Sweet flag likes to grow in or near water and can tolerate full sun to partial shade. The root is bitter and is an excellent digestive tonic and be used to reduce addictions. It filters stagnant water in the ground as well as in the body. It will only flower if in water. Cumin is an aromatic culinary spice used extensively in the Mediterranean but is found in cheese and salad dressings to north and in curry blends to the east. It is the seed used in both cooking and medicine. Cumin is a digestive herb and is very helpful in reasonable amounts for vata types and in somewhat higher doses for kapha types. The use of cumin in cooking stimulates the flow of saliva and gastric secretions thus making food easier to digest. This means that assimilation is improved and even minerals are better absorbed. The aromatic properties help to relieve gas and toxins. Cumin is very easy to grow and is suitable for zones 5 to 10. Gotu kola is a tropical herb but can be grown in temperate climates. It is a ground cover and once established spreads by runners. The germination rate is quite long in temperate climates, but it can be grown in zones 7-11. Known as Brahmi in Ayurvedic medicine, gotu kola holds a place of great honor among the rasayana herbs. It is used to improve memory. It is calming and aids sleep. The leaves can be used in salads or taken medicinally. Luffa gourds are mainly tropical or subtropical vines with an edible vegetable that is better known for its use as a sponge or luffah. This is great fun for children to grow. In Ayurveda, luffa is eaten raw as a cooling demulcent in salads. The bitter juice is used to treat jaundice. If eating this gourd, it should be harvested young before it becomes tough and more suitable for use as a body scrub. The guggul plant is the source of a precious resin used in incense, but it possesses many valuable medicinal properties as well as having a lovely aroma. Guggul is a rasayana herb, meaning it is both antioxidant and life sustaining. It emulsifies lipids and therefore is used extensively in obesity, but it also lowers cholesterol as well as the risk of heart attacks. The plant usually has to be grown indoors in the temperate climates but in zones 10 to 12, it thrives in quickly draining soils. This basil comes from Amritapuri, India, where it is used mainly for tea. It has reddish purple leaves tinged with green leaves, but the very young leaves may be initially green. It has a lovely aroma. Amrita is the nectar of the gods and is believed to promote longevity. Tulsi is adaptogenic, antifungal, and antibacterial. Seeds are normally sown outdoors in spring but tulsi may be grown indoors throughout the year. This tulsi is hardy to zones 10 to 12. This is the true tropical tulsi with purple leaves that many use to make tea. Due to many name changes in the last years, people are justified in being a bit confused. Tulsi can be grown indoors or out. It requires light to germinate, and, for the same reason, seeds should be planted in shallow soil. Planting tulsi can be a family ritual in which homage is paid to the Divine Mother with blessings to be shared with all. Tulsi means "the incomparable one" and this holy basil is one of the most revered herbs in India. It is highly aromatic and is used for purifying space, more or less as incense is used or smudging is done in other cultures. The leaves are green and the stems are purple. It is highly aromatic. Please allow at least 16 days for germination. Please note, there was a name change for these seeds in December 2010. These are what used to be called Krishna Tulsi. Holy basil is adaptogenic, antifungal, antibacterial and immune enhancing. This tulsi have green stems, small leaves, purple flowers and is frost-hardy. For those in temperate climates, these are the easiest to grow of the several tulsi varieties. Please note, there was a name change for these seeds in December 2010. These are what used to be called Rama Tulsi. Then, it became known as Kapoor Tulsi. This was changed in 2017 to Temperate Tulsi. This is the original wild tulsi and is higher in eugenol. It is a perennial bush basil but needs to be protected from frost. It is slightly hairy, green-leaved, woody-stemmed, and grows to a height of four feet if protected from frost. In colder climates, it can be grown as an annual or brought indoors for the winter. Lemongrass is a multipurpose plant. It stalks can be eaten, such as in tom kha gai, a delicious Thai soup made with coconut milk and galangal. The stalks can also be dried and used to make tea. The stalks should be whitish at the lower part of the stalk and greener at the top. 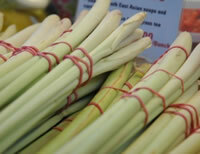 Lemongrass can also be steam distilled to make essential oil. It is an insect repellent but can be taken internally to aid digestion and relieve jetlag. It is also antifungal and can be applied externally for conditions such as athlete"s foot as well as rheumatic complaints. It is hardy to zone 10 but can be brought indoors in the winter in cold climates. Sacred red lotus is edible, but it is also often used in rituals. Young roots can be marinated and eaten raw. Older roots should be cooked in more or less the same manner as carrots or burdock, but there are many recipes to try in Asian cuisine, both Indian and Chinese. The seeds are also edible. They are often popped and can be eaten more or less as we would eat popcorn. The taste is quite bland but becomes more zesty with some ghee, turmeric, sea salt, and cayenne pepper. Lotus seeds are sweet and mildly astringent. They are regarded as tonics for the spleen, heart, and kidneys. The root is also beneficial for the heart and kidneys. The leaves can also be eaten, but they are more bitter. They are mainly used to reduce lipids. Sacred Red Lotus is suitable for zones 8 to 12. Native to the Himalayas, hardy to 20° F. Rare. Does well in pots. Shatavari is a woody climber reaching as high as 6 feet, bearing small, white flowers. In Sanskrit, Shatavari means someone who posesses a hundred husbands. The spring shoots, mucilagenous roots and the leaves are all used. This is the main Ayurvedic rejuvenative tonic for females, used for treating sexual debility, infertility, menopausal symptoms and as a galactagogue. Spilanthes is nicknamed the toothache plant. The leaves and flowers can be chewed and used for oral hygiene and pain relief. Spilanthes is antifungal and antiparasitic. It has also been used to treat co-infections of Lyme disease. The seeds take 1-2 weeks to germinate and require some warmth. Spilanthes is native to Brazil and Africa. It is easy to grow. Its properties are similar to echinacea. The plant is non-toxic and the leaves can be used sparingly in salads. It is perennial in warm climates and an annual in colder climates. Plant 12 inches apart.